Description: Soft...Beautiful...Solid...Accurate. Plus, a Nice, warm blanket! 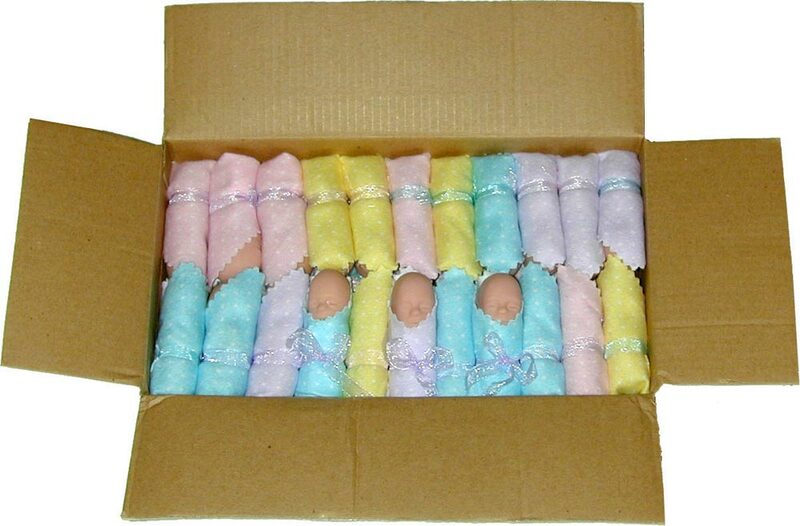 Each box of fetal models comes with assorted blanket colors in quantities of 40+. Mix and match colors and languages. Precious little ones are a great learning took for everyone. They help show the humanity of the unborn at the earliest of stages. These models are a great teaching tool. They are inexpensive so you can give them away. Young girls are especially drawn to them. I also give them to mothers so that they can teach their children about pro-life. Ordered these to give to women who have had abortions. Do wish I had received one of every color, but they are precious. I got one at the NE state fair and decided to order some for our showcase (St. Marys Catholic Church) booth. We have on display the whole set also. We use these in our booths at community events. We give them out free because we want to share the impact of them with others. We are a small center but it is worth purchasing them. I love the idea of naming them - we will be encouraging that! The blankets made it even more sweet. These wonderful models are always a big hit. The little blankets seem to make them even more appealing and life-like, cuddly actually. We have run out again. We are also going to use them in the 6, 7, and 8th grades of our parish school this year, in conjunction with the Spiritual Adoption program. We used these at our last two booths one was a parade the other a 4th of July celebration. At both they were our best seller. The more people that bought them and carried them around the more people would see them and seek us out. They attached children to our booth and then the parents would follow and give us an opportunity to share our message of life. In the past we had tried wrapping our own babies. Buying them already wrapped was well worth the money. I got one of these baby's at my 4H fair and they are beautiful. I will buy more so that everyone can see that the little tiny babies deserve a right to life too. I pass these out in the gift bags that women receive after a positive pregnancy test. These are even more realistic than the previous fetal models. This little baby speaks a thousand words. These are given to the moms at the abortion clinic. When they see them, you can tell it sparks doubt in their hearts and it leaves a lasting impression. I love the feel of them, so soft. We used these at our pregnancy help center's banquet as "table decor" near every place setting. 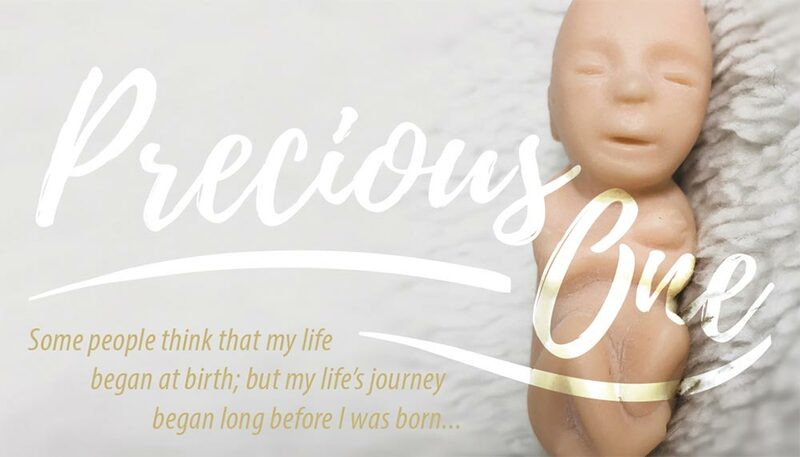 The reason we are here is to help save babies, and what better way than to swaddle a precious baby and see it throughout a banquet or celebration of human life event? Loved them! These models are THE BEST! We got them from our 40 Days coordinator to use at sign ups. The little girls LOVED having a baby to take home and care for. I encouraged them to name their baby. The moms were very appreciative to have such a powerful visual for their daughters. At our pregnancy center we have found that these fetal models in the tiny blankets always bring big smiles. We hand them out at churches when we are invited to speak there, and we use them in the schools when we go to teach our abstinence lessons. We LOVE these babies! I have a Precious One with Blanket that was given to me a couple of years ago in memory of my own sweet little boy whom I lost. He is very precious to me indeed! Thank you for a wonderful life-like product that can help heal grieving hearts! This year we ordered the models with the blankets for our pro-life fair booth and they were a real hit. Even though the features of the baby aren't as visible, I'm sure the blankets will come off and they will be visible then. 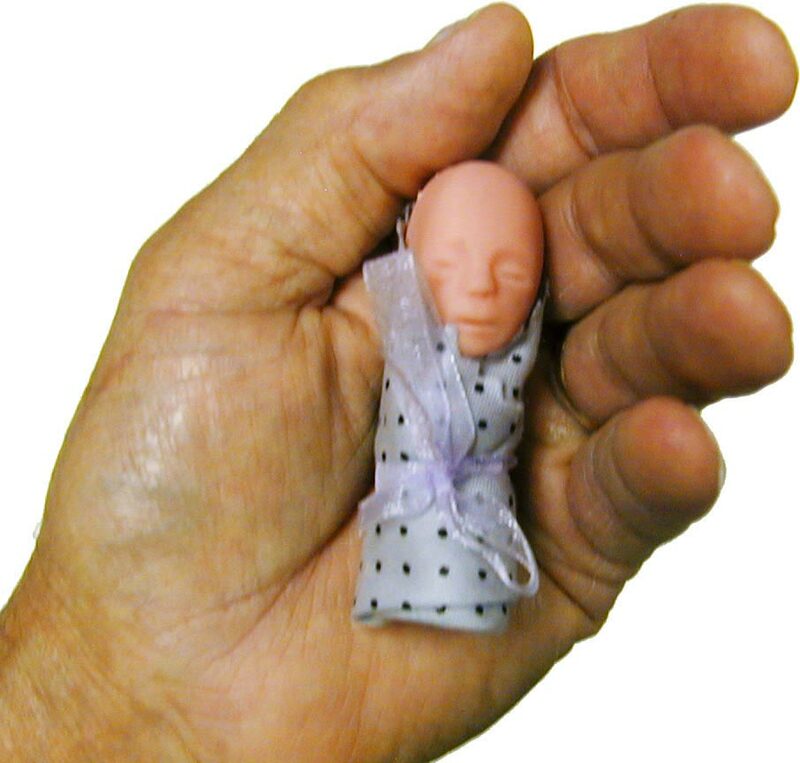 But holding a model in your hand with the blanket is heart-warming and makes one think pro-life for sure. 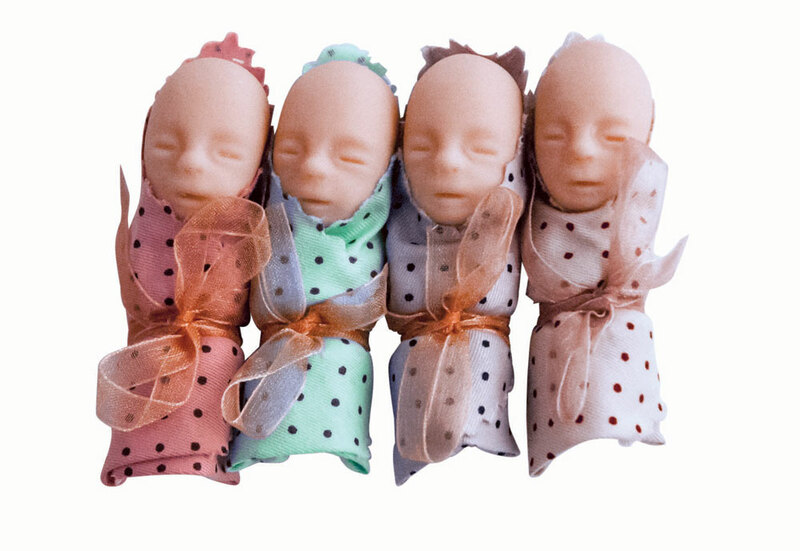 These darling babies are like a magical draw to my pro-life booth at the Go 4th Festival and at our county fair. They are a great fundraiser as I use them as a premium for a $1.00 donation. It is a lot of fun watching children and even some adults deciding on a "boy" or a "girl" baby depending on the color of the blanket. Our clients love receiving these in their positive bags. They find it so interesting to see just how small their babies are. These baby models make a huge impact when we have a sexuality talk and Natural Family Planning classes with the Marriage Preparation couples. I highly recommend them. 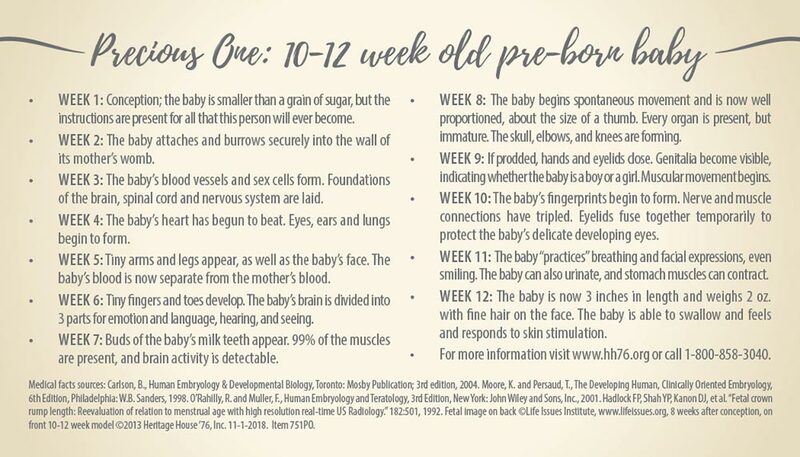 Thees are great because sometimes children want to take the bigger (30 week) models but we can gladly give tnem a smaller one (12 weeks) to take home. The effectiveness lies in the clarity of the model. It is important to see the little fingers and toes. Please order the ones WITHOUT the blankets. Little babies in blankets are a huge hit! I keep some in my purse, take them to my doctors and even give them to complete strangers. Everyone is pleased and thrilled when a little one is put into their hands. They are precious soft babies, so small and yet make a big impact on people helping them understand who and where real babies (looking just like the models) came from. They are a reflection of God in a blanket! I love the message on the cards and can share with everyone! Heritage House, your items help to bring the blessings of life to the forefront and aid in the remembrance of those unborn who wait in Heaven with their Savior. 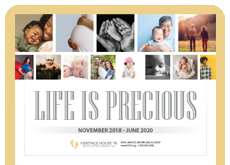 Thank You, Heritage House for doing so much to make a future possible for all of those unborn and daily help bring awareness to the world that conception is the beginning of life! Great for training purposes. Very durable also. Kids get a kick out of them knowing they used to be that small. I received one of these at the local "40 Days for Life" kick-off. i was moved by the sweet little person in my hands. When I shared the precious one with my friends, they too were touched. What a beautiiful way to show the beauty of life. We ask our supporters for "Youth March for Life" to hold one in their hand. Thanks! I had to order these right away. The blanket is impact-full and I have seen it make a difference to mothers who were considering abortion. It has changed their mind and heart! I help organise a Great Expectations Stall at the Annual Agricultural Show in Adelaide South Australia. We show people the miracle of life from conception to birth. We have just finished the show week, and found that we ran out of these foetal models, they were so popular. We did not have them with the blanket around them. I think this is a brilliant idea, as a number of little children buy them to play with. I pray the image of this foetal model never leaves them. I love giving each student a baby for their own at the Release Time Events. This is a religious education time the school allows for our students 1 - 12. The soft babies (and i like the newer ones with blankets) are delightful and welcomed by both genders. Thank you for your resources and work you do for promoting Life and the tools for teaching Life. God Bless You. 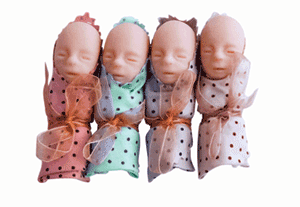 We have been using these in 2 ways: -1- Our church Respect for Life Ministry was getting some resisitance to us having the older fetal models as give-aways at our Carnival table. The blanket seems to make all this difference! The various colors are a nice touch also. -2- We also use them as pass-arounds to Grade 6, 7, & 8 students as we discuss fetal development. It eliminates the "eeww - gross" reaction that some kids had with the prior version of models.